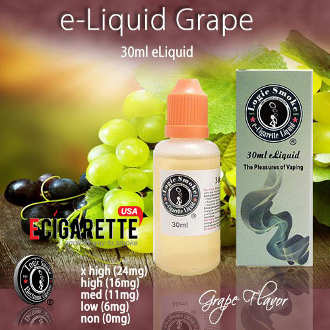 Our Grape e juice from Logic Smoke is a true to life grape flavor that is gently sweet. You will enjoy this where you decide on it being your everyday vape or just as a treat. It is also a wonderful addition to our Peanut Butter e liquid juice flavor. Buy a bottle of our Logic Smoke Grape e juice and awaken your palate. The 30ml bottle is a convenient and economical size for purchasing in quantity. Fill your clearomizer or other e liquid juice atomizing device directly from the bottle or use it to refill your smaller travel-size e-liquid bottles. You'll be ready and have liquid on-the-go at any time. Experiment and decide what is best for you. You'll love the fruity flavor of the Logic Smoke Grape e liquid juice. Happy vaping! !